Today’s one dish recipe was one of three finalists in CHOW.com’s Best Boneless, Skinless Chicken Breast Challenge. Of the three finalists, this was the only recipe both readily adaptable to low sodium cooking AND a complete package (meaning, a whole meal). As soon as I voted for it, I printed it out and made my way to the kitchen speedy quick. HOORAY! Another simple, one pot meal for my (dun-dun-daaaah!) Dutch Oven!! I was NOT disappointed. 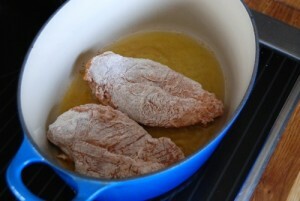 The meaty breasts are first breaded in a salt-free seasoned flour, then browned to a golden crisp. Because of this step they retain their shape (and yummy coating) during cooking, rather than simply falling apart like a stew. The result is a sensational “best of both worlds” meal. 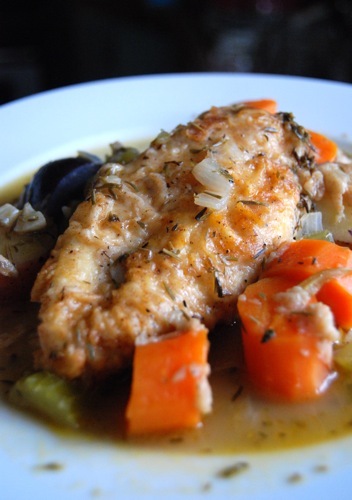 The tender-crisp veggies with herb-flecked broth bathe the succulent breaded breasts. If it sounds amazing, that’s because it IS. Many thanks to Trey Moran for sharing! Measure the flour into a mixing bowl. Add the ground pepper, garlic powder and paprika, and whisk well to combine. 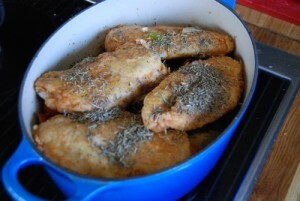 Dredge the chicken breasts in the seasoned flour, coating each thoroughly. Heat the olive oil in the Dutch oven over medium. 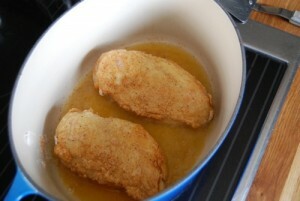 Once oil is hot, add the breasts, two at a time, frying just until golden brown. You don’t want to cook – just brown the outside. Remove from pot, place on towel to drain, and repeat with other two breasts. Set aside. 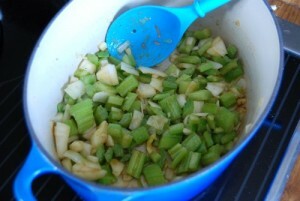 Once breasts are browned, add the onion, garlic and celery to the (now empty) pot. 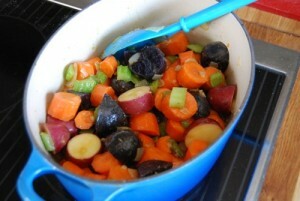 Cook, stirring, until softened, then add the carrots and potatoes to the pot and stir to combine. Place the browned chicken breasts on top, then sprinkle with the remaining herbs and freshly ground black pepper to taste. Pour the broth over top and cover with lid. Place on the middle rack in the oven and bake, covered, 30-45 minutes, until the carrots and potatoes are soft. 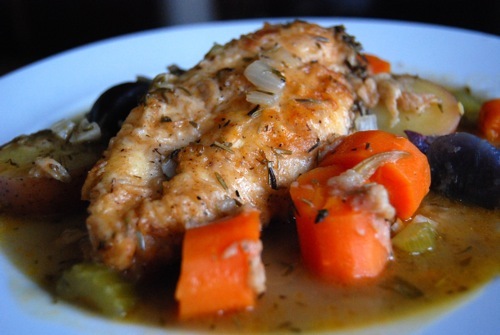 Remove from oven and serve immediately, plating each chicken breast with a generous portion of vegetables and large ladle of broth. This entry was posted in Main Dishes and tagged CHOW.com. Bookmark the permalink. Boy, that DOES look good. I just love cooked carrots . . . and breaded anything. The fact that you happen to have the prettiest Dutch oven in the world helps with my salivating, too. Okay… so while it was 70 degrees here last week it just snowed again last night (which makes this recipe look even more appetizing)! It looks cheerfully delicious! Katie, I know I am a one trick pony w. these one pot meals but that’s b/c they truly are SO GOOD. I love the way this one has breaded chicken though, it’s like eating chicken parm (sans sauce and cheese) with broth and veg instead. So healthy but it doesn’t taste it. Haha!! PS: Dutch oven says You’re looking mighty fine too. I like this idea. Resting the chicken breasts on top of the vegetables is genius. That way the breasts don’t overcook and fall apart, yet the vegetables cook all the way through. Hi Shambo! Yes, I thought it was incredibly clever too – and a great idea for other recipes. You made my recipe perfectly! This is one of those dishes that everyone loves once they try it. I also use the same method for braising brisket. I rest it on a bed of onions and peppers just to keep it up off the bottom of the pan. Thanks for sharing it with your followers. PS: Thanks for the heads-up on the brisket — sounds delicious and definitely worth trying too. Best chicken dish I made in a long time! This looks amazing and easy enough to make Paleo friendly. I was trying to find something for dinner tonight and found it. Can’t wait! Do you know what the sodium content is on this recipe? 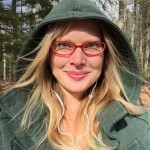 We need to track everything due to my husband’s heart condition. By the way your recipes have been the best I’ve tried thus far! Do you think after browning the chicken, this could be finished up in the crockpot? I am always looking for crockpot recipes and also I do not have a dutch oven Also, do you think it would be good with bone in chicken thighs? I have a package of those in my freezer and have no idea what to do with them. This was really excellent. The whole family loved it. I used a 9qt Lodge cast iron dutch oven so I was able to fit a lot of chicken in there. I’ll definitely make this again only I might do thighs next time. Just my kinda deal! 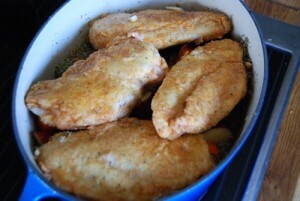 I was able to fit 5 chicken breasts into my 5.5L dutch oven. I dumped the remaining seasoned flour in with the onions to thicken the eventual sauce and added about 1/2 liter of cooking wine, a little miso, some worcestershire sauce and a dash of vinegar for fun. Yum. Thanks for the inspiration. Looks delicious! Do you think this cooking time/temperature will work with only 2 chx breasts? I only cook for me, so four pieces of chicken means i have a lot of leftovers Thank you! It was delicious!! Making it again tonight. Thank you! I made this tonight with a few changes, we did not have all of the ingredients. It was a big hit! I pounded the chicken breasts before the flour mixture, doubled the onion and garlic. I did not have potatoes but did brown rice on the side, yummy with the gravy. I dded 1/2 cup of French white wine and 1 cup of chicken broth. My family loved it and asked for it again. Made this tonight and plates were licked clean. Only thing I did different was serve it with mashed potatoes instead of adding potatoes to the pot. The flavor of the veggie/chicken was delish. 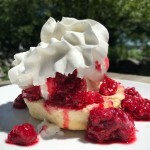 Great recipe- thank you for sharing! This is so good!! I didn’t have any rosemary and I don’t know what herbs de Provence is, so I made it without both – and it was amazing! So moist and delicious! I will definitely make it again! You can make your own version of Herbes de Provence at home- with or without lavender! Here’s a link to a good recipe for it: HERBES DE PROVENCE. It’s a combination of savory, thyme, basil, marjoram, lavender, parsley, oregano, tarragon, ground bay leaves, rosemary and fennel. The proportions are in the recipe above. But feel free to tweak to suit your own taste. Would you change anything in the temp or cooking time if you cast iron dutch oven that is not enamel coated? Sounds good and would like to try. Also fairly new to cast iron cooking, any suggestions of a great cast iron cookbook? I have Lodge cast iron products, seems to be the most available products around here. Are they reliable? I’m sure the recipe would translate just fine to an uncoated cast iron cooker. No need to change anything. I don’t have a cookbook to recommend, but I do use Lodge pans all the time and absolutely love them. They wear like iron (pun intended) and are great for all kinds of cooking. Just don’t put them in the dishwasher!! Always hand wash and dry before storing. Thank you. I am always afraid of cooking or baking at to high of temp. I have always been told to back the temp off and cook or bake longer. I appreciate your encouragement and feedback. You’re so welcome, Bob. Best of luck w the recipe! Really hope you enjoy. 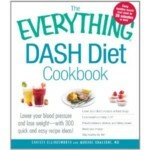 This was awesome, I used our favorite seasonings and added, mushrooms and squash! Hubby said it’s a keeper!! WOOHOO! wonderful to hear, Jill! So glad you enjoyed it.